A Fire Alarm Control Panel (FACP) / Fire Alarm Control Unit (FACU), is an electric panel that is the controlling component of a fire alarm system which is installed at various places as a protective measure against fire; sounds an alarm when actuated by a fire detection system. Fire Alarm System is essential to warn all occupants that a fire or emergency situation exists. Sometimes fire detection and alarm systems are used to compensate or to give special cover for items of high value. In case of fire early detection of smoke and heat helps in fighting the fire effectively & extinguishing it in nascent stage. Thus by early detection, we can prevent the fire from spreading in turn saving life and loss of property and business. Whatever the reason, an automatic fire detection and alarm system generally provides a network of manual call points, fire sensors and alarm warning devices over the area covered. It is, in effect, the eyes and mouth of the building to constantly monitor the building and warn if a fire breaks out, or is suspected in the way we do, if we see flames or smell burning. • Conventional Systems are used for small installation as it becomes cost effective and also serves the purpose of safety and location identification is easy. • Linear Heat Sensing Cables. The panel receives information from environmental sensors designed to detect changes associated with fire, monitors their operational integrity and provides for automatic control of equipment, and transmission of information necessary to prepare the facility for fire based on a predetermined sequence. A fire alarm control panel is required under the building code for a majority of new commercial building construction in most countries. Conventional Systems are used for small installation as it becomes cost effective and also serves the purpose of safety and location identification is easy. It is a well-proven technology protecting many hundreds of thousands of properties worldwide. 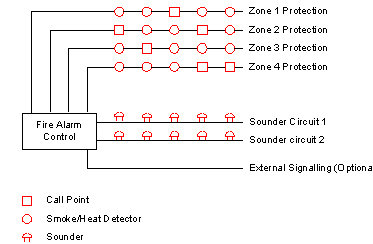 In a typical Conventional Fire Alarm System the 'intelligence' of the system resides solely within the Fire Alarm Control Panel, which receives a trigger signal from a Conventional Detector or Call Point and in turn, signals the condition to other devices such as alarm sounders and remote signalling equipment. The control panel operates from house power but also usually contains an emergency battery which can operate the system for about 24 hours during a power outage. • The System Alarm LED shall flash. • An electric signal in the control panel shall sound. • The LCD display shall indicate all information associated with the fire alarm condition, including the type of alarm point and its location within the protected premises. • The audio portion of the system shall sound the proper audio signal consisting of alarming tone.